Mahatma Phule may have been one of the least educated modern Dalit leaders, but he was perhaps the most original and creative thinker. He was unusual in that rather than keeping his wife in the background, he allowed his wife to become a social revolutionary with her own ideas. 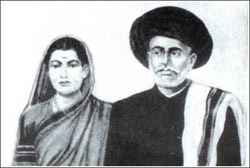 First and foremost, Mahatma Phule and his wife Savitribai created an educational revolution. Savitribai created not just the first school for Dalit girls but the first school for girls in Indian history. Theirs was an education with the simplest of curriculum, with few books, but it instilled a longing for justice, a determination to fight for personal dignity that still transcends current educational efforts. For it is not just good books, it is the moral ardour and purity of purpose of the teacher that is the essence of genuine education. Such inner integrity cannot be achieved without an inner revolution. Otherwise the pedagogic legacy of such Mahatmas dies with their bodies. In the middle of the Brahmin renaissance in Pune, Phule was the sole voice of the voiceless Dalits. For the first time in Indian history, Dalit and Brahmin debated in public and in print. For the first time, a Dalit published books attacking Brahminical rule. The media revolution launched by Mahatma Phule and his supporters cannot be underestimated as it undermined the bogus moral and religious legitimacy of casteism. Phule used his media revolution to attempt a cultural revolution by creating the utopia of Baliraja as opposed to Brahminical Ramrajya. Due to his very lack of western education, Phule was able to outsmart and outthink his enemies in creative ways. He is the real mahatma who belongs on the currency of India, as he is the first modern Indian to propagate sama-samaja. Proud to be an Indian and feel sad for do not participate in their work. feel sad for do not participate in their work.